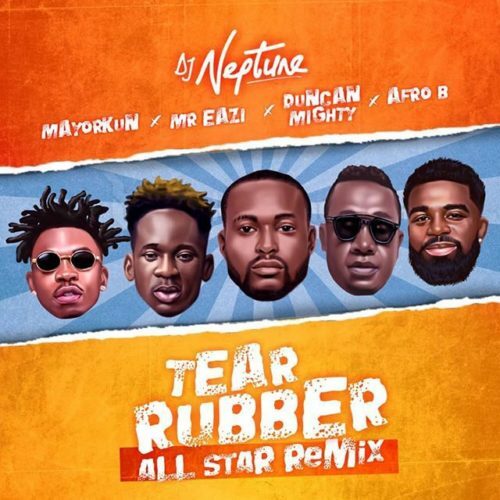 Jump on this new piece of music from DJ Neptune – Tear Rubber (All Star Remix) ft. Mayorkun, Mr Eazi, Duncan Mighty & Afro B out now! Premium disc jockey, DJ Neptune comes with a lovely new piece of music for the fans ‘Tear Rubber (All Star Remix)’. The song was originally done with Mayorkun but the remix captures sensational Mr Eazi, Port Harcourt first son Duncan Mighty and Afro B. All star remix gives a big boost to the original song as the featured artistes deliver superb verses. Listen, enjoy DJ Neptune – Tear Rubber (All Star Remix) ft. Mayorkun, Mr Eazi, Duncan Mighty & Afro B below. Kindly share!